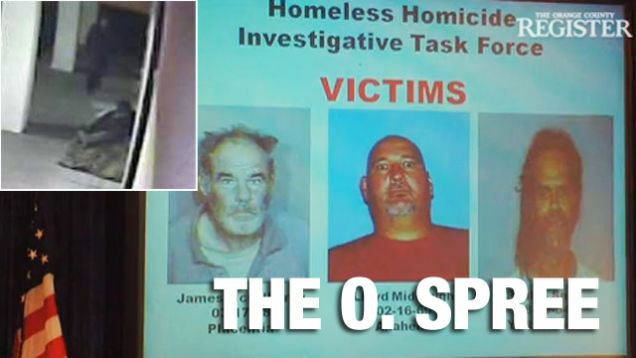 "What we believe to be a serious, dangerous serial killer operating in Orange County" is how police described the man who has now stabbed three homeless men to death on California streets. The first victim, James McGillivray, 53, was killed on December 20, as he slept outside a shopping mall in Placentia. The second, Lloyd Middaugh, 42, was discovered eight days later on the Santa Ana River Trail. Two days after that came a third victim, discovered behind Yorba Linda library: He was Paulus Corenlius Smit, 57. The victims were all stabbed multiple times in their sleep. The only lead so far comes from surveillance video taken in the moments leading up to the first killing, The O.C. Register reports. In it, a figure in a dark hoodie — the killer — approaches McGillivray from behind. The video also features a white Corolla, early 2000s, parked near the murder scene. Police have no plates, but call the car, which pulled out of the parking lot an hour before the killing, a "vehicle of interest." The Anaheim Police Department asks anyone with information to call 714-765-1944 or email htf@anaheim.net.